When it comes to making an “all-time list” there isn’t a very long list of female poker players to choose from, considering poker has been, and continues to be, a male dominated game. But there is one female player in today’s game that is proving that she belongs at the top of the list and can be as successful as any male player, Vanessa Selbst. In my opinion Selbst is by far the greatest female tournament player in the game’s history, and should be considered one of the game’s all-time greats, male or female. Selbst has made six WSOP final tables in open events (and a seventh in the Ladies Tournament in 2007); she has finished 3rd in a WPT Main Event; made the quarter-finals of the NBC National Heads-Up Championship; and has won four side events at major tournaments during her career –not bad for someone who has about seven years invested into the game. Selbst has also been extremely consistent, having won at least $840k every year since 2010, and has won at least $100k since 2006. 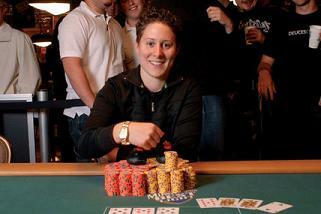 So who could challenge Selbst for the title of the best female player in poker? There is of course the most notable women in the game like Annie Duke and Kathy Liebert, but you’d be hard-pressed to find anyone that feels either of these two (despite distinguished careers) stack up to Selbst, or could somehow eclipse her results in the future. Then there is Jennifer Harmon, who spends most of her time playing high-stakes cash-games, which makes it hard to compare her to a tournament player. There are a number of talented young female players coming up through the poker ranks, and this is likely to be where Selbst’s challengers come from. Players like Liv Boeree, Melanie Weisner, Xuan Liu, Lucille Cailly, Amanda Musumeci, Maria Ho, Annette Obrestad, Sofia Lovgren, Jackie Glazier, and Dee Dozier are all up-and-coming talents, who have already started to put together impressive resumes of their own. The problem is, Selbst is still young herself, and shows no signs of slowing down! The reality of the situation is that Selbst isn’t just the greatest female tournament player of all time; she is right in any conversation discussing the greatest tournament players in the game, and could very well go down as one of the all-time greats, male or female, when all is said and done.